Although musicians in bands ranging from Railroad Earth, The Avett Brothers, Yonder Mountain String Band, Keller Williams & Friends, Trampled by Turtles and Dave Rawlings Machine continually sang Del's praises during his four-day Memorial Day bluegrass festival in Cumberland, Maryland, the man of the hour stayed mainly in the background. A former member of Bill Monroe's Bluegrass Boys, Del has always felt that the bluegrass format should grow and expand to remain relevant. His band -- including sons Rob McCoury, who recently recorded with Willie Nelson, and Ronnie McCoury, who joined the other Travelin' McCoury's on tour with Dierks Bentley -- give play shops and join casual jams to foster new musicians interested in the genre. Plus DelFest benefits the financially beleaguered area where it is based. Yet what makes DelFest truly stand out is that it's all family-oriented. "We have just a great line up," Del told The Boot while watching The John Cowan Band take the stage after Cornmeal finished their set. "I am enjoying all if it; I really am." The approximately 20,000 fans from throughout the country that jammed DelFest apparently did, too, forming casual players' circles in the midst of the festival's campgrounds, continually calling out good-naturedly to the musicians on stage and dancing even during rain showers. Whether the bands played Bill Monroe's 'Bluegrass Breakdown,' the classic 'Nashville Cats,' or even more contemporary tunes such as Yonder Mountain's 'Another Day' or Willie Nelson's 'Blackjack County Chains,' the good mood never dipped. "Are all of you having a good time this afternoon?" Del asked from the stage as screams and shouts erupted from the crowd made up primarily of those in their 20s and 30s. "That's all we want -- to have you enjoy all of the artists we have here." There were plenty of opportunities to do just that, either by enjoying performances on the two stages, joining late-night jam sessions or becoming involved in musicians' play shops. Unlike the atmosphere at many festivals, the DelFest is very welcoming. Think of a family-oriented, well-equipped, bluegrass version of Woodstock and you understand the vibe. The organizers of the concert have made a conscious decision to keep the festival small and music oriented so that people feel comfortable bringing their families to it. Del tells The Boot that although other venue options are available, he plans to keep DelFest in Cumberland. "When I first saw this place with the Potomac [River] and the rock cliffs I said 'This is just a beautiful place.' As far as I'm concerned, I'd rather play here than anywhere else," he quips. "We found out later that Cumberland had hard times and we told them we are not going to come here one weekend and leave. We want to be part of the community every year. We want to help with the food banks and give money to different [projects]." That suits Allegany County Commissioner Jim Stakem just fine, telling WCBC Radio (1270 AM) that despite other areas efforts to lure it away, he wants DelFest to remain a strong force in the community. As DelFest attendees chilled out in the glow of red, white and blue light spilling from the stage, there seemed little reason to worry that DelFest would leave its adopted home. 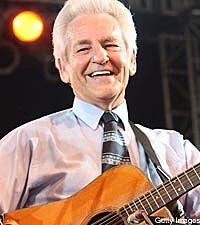 "You are gone, but you are not forgotten," Ronnie McCoury told the crowd from the stage as he introduced a song. "That's true for all of you, too." Find out more about DelFest and register to receive e-news bulletins at the festival website.